From 27 May to 24 Jun 2017, award-winning buffet restaurant, Carousel, welcomes guests to Savour the Taste of Thai and feast on authentic cuisine from the Land of Smiles. Royal Plaza on Scotts invites three guest chefs from the culinary team of The Dhara Dhevi Chiang Mai, Thailand, for this dinner promotion, a tie-up between the two hotels who are both members of Preferred Hotels & Resorts. Head Thai Chef of The Dhara Dhevi, Chef Chanin Jakkased, is a veteran of the hospitality industry whose culinary journey began when his mother’s passion for cooking inspired him as a young boy. Specialising in Northern and Thai cuisine, Chef Chanin consistently introduces innovative dishes using the freshest products and best ingredients available to ensure high customer satisfaction in his dishes. Chef de Partie of The Dhara Dhevi, Chef Noppakao Bunnag, who has been with the hotel for 10 years, specialises in fruit carvings and making traditional Thai desserts. Wok chef, Chef Tanat Malangpan, has over 16 years of experience in the kitchen and specialises in wok cooking, curry and barbecue dishes. 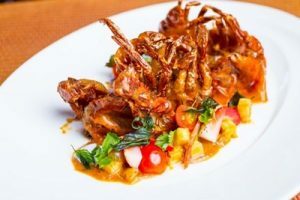 Guests can look forward to signature dishes such as Yan Ma Muan Poo Nim Thord (spicy soft shell crab salad with green mango and mint leaves), Gang Ped Ped Yang (red curry with roasted duck and lychee) and Buea Loy (rice dumplings in coconut soup). There will be three menus on rotation throughout the promotion period. Savour the Taste of Thai promotion is available during the dinner meal period from 6.30pm to 9.30pm at $83++ for adults and $49++ for children. In addition, Relish the Heritage of Local Cuisine at the all-new Scotts Lounge from 2 – 24 Jun 2017. Located at the second level of Royal Plaza on Scotts, Scotts Lounge overlooks the bustling streets of Orchard. 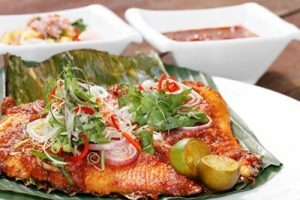 Featuring a wide array of exciting local delicacies such as signature salted yolk fried rice with seafood and crispy silver bait, wok-fried black pepper crayfish, homemade jumbo satay, sambal stingray and Singapore laksa, guests can look forward to the taste of familiar local delights with elevated flavours. 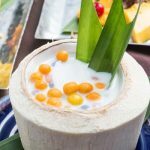 Guests who enjoy local desserts will be pleased to find a variety of cold desserts such as durian pengat, sago gula melaka and mango sago with pomelo in coconut cream, and hot desserts like steamed yam paste with ginko nuts and bo bo cha cha on the counters. Relish the Heritage of Local Cuisine promotion is available during the dinner meal period from 7pm to 9pm at $55++ for adults and $32++ for children.